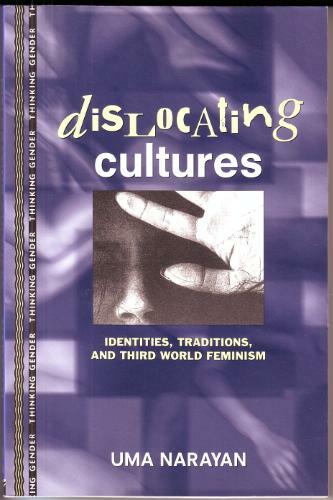 Contesting Culture: “Westernization, Respect for Cultures, and Third-World Feminists: Dislocating Cultures: Identities, Traditions, and Third World Feminism (Thinking Gender). New York: Routledge, 1997. Print. In this chapter, Uma Narayan analyzes the relationship between Third World Feminism and the West, critiquing the way that Third World feminists are often read, by both Western feminists and people in their own families and/or nations, as being “Westernized” in their ideologies: “Many Third-World feminists confront the attitude that our criticisms of our cultures are merely one more incarnation of a colonized consciousness, the views of ‘privileged native women in whiteface,’ seeking to attack their ‘non-Western culture’ on the basis of ‘Western’ values” (3). Narayan argues that this representation of Third World feminism disregards feminist histories within nations in the East and Global South as well as the way that women can (and often do) arrive at feminism through lived experiences of oppression. She also analyzes the relationship between feminism and respect for one’s culture, arguing that arguments that posit a feminist critique of one’s culture are rejecting the culture or the result of adopting a colonized or “Westernized” mentality fail to see feminist critiques as part of the landscape of intracultural debate about social institutions (9). “I want to remind her (her mother), though I cannot bring myself to it, of her pain that surrounded me when I was young, a pain that was earlier than school and ‘Westernization,’ a call to rebellion that has a different and more primary root, that was not conceptual or English, but in the mother-tongue. One thing that I want to say to all who would dismiss my feminist criticisms of my culture, using my ‘Westernization’ as a lash, is that my mother’s pain too has rustled among the pages of all those books I have read that partly constitute my ‘Westernization,’ and has crept into all the suitcases I have ever packed for my several exiles” (7-8). In a point that I think connects well with Berlant’s The Female Complaint, Narayan discusses how her sense of marriage as an oppressive institution came before her feminist education, from the mouths of “Indian women in general, my female relatives in particular” and that the mistreatment of women in marriages is not only a commonly known cultural issue but also, “staple ingredients of the ‘family dramas’ depicted in Indian movies, and thus openly acknowledged elements of popular cultural awareness” (9). She argues, then, that the difference in the critique of feminist daughters is not in content so much as in tone: “Just as daughters seldom recount their mothers’ stories in the same terms as their mothers tell them, feminist daughters often have accounts of their mother-cultures that differ in significant ways from the culture’s own dominant accounts of itself. Telling the story of a person whose life is intertwined with one’s own, in terms different from her own, is often a morally delicate project, requiring accommodation and tact and an ability to leave room for her account even as one claims room for one’s own. Retelling the story of a mother-culture in feminist terms, on the other hand, is a political enterprise. It is an attempt to, publicly and in concert with others, challenge and revise an account that is neither the account of an individual nor an account ‘of the culture as a whole,’ but an account of some who have power within the culture” (9-10). She further argues that to retell that story in a feminist critique is to move the private and hidden into the public sphere. subverting cultures of silence and shame.